Concerns over product quality are top of mind for European companies that source abroad, according to Amber Road’s recently released 2018 E.U. Sourcing Survey Report. The complexity of international trade compliance is a close second. This insight comes from a survey Amber Road conducted of more than 150 respondents from companies based in the European Union. Sixty-four percent of the respondents represent companies that source from more than 10 countries, and 54% have at least 100 suppliers across their sourcing regions. The survey found that the majority of the companies do a significant amount of sourcing within the E.U., perhaps to alleviate the aforementioned concerns about sourcing abroad. Aside from product quality and trade compliance, survey respondents also expressed worry over potential disruption, lengthy time to market and inadequate technology for managing long-distance sourcing. For example, three-quarters of the respondents’ companies source from Asia, where transportation disruption is a common risk. Hence, the list of factors companies consider when deciding where to source from reflects their concerns, to a degree. As the chart below indicates, the top consideration by a significant margin is product quality. E.U.-based companies don’t shy away from sourcing abroad, despite their concerns. Asia and North America are popular choices, especially the former for the textile and manufacturing industries. 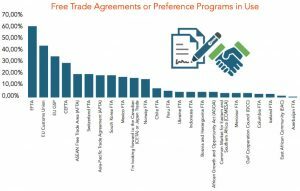 Another notable finding is that many companies are not taking advantage of free and preferential trade agreements, a potential source of savings. About a third of the survey respondents said that their companies do not have a system to manage trade agreements and lack internal expertise in this matter. But it’s not simply a matter of expertise. For a quarter of the companies surveyed, such as those that source from China, there is no current free trade agreement covering their sourcing locations. As far as sourcing and supplier management in general goes, the survey respondents cited supplier collaboration and communication as their top challenge. Other top concerns included lead time, regulatory trade compliance and unforeseen supply chain costs. Political instability, cultural differences, supply chain visibility and internal bureaucracy rounded out the list. Has Low-Cost Country Sourcing Lost its Appeal?